Reduce the time spent on shaving, plucking and waxing unwanted hair with laser hair removal in Oshkosh, WI. The Laser Institute of Wisconsin™, created by Fox Valley Plastic Surgery, uses advanced laser technology to provide long lasting freedom from unwanted hair. Offered in the Oshkosh office, this safe, effective treatment works for men and women with hair in undesirable places, including the face, back, underarms, bikini line, legs, and arms. The Laser Institute of Wisconsin has extensive experience a range of advanced treatments. Women and men visit our skilled laser technicians for laser hair removal from places such as Green Bay, Appleton, Fond du Lac, and Sheboygan, WI, to perfect their personal Renaissance. Contact the Laser Institute of Wisconsin at (920) 233-1540 to request your free laser consultation. Sciton BBL Laser hair removal uses a highly concentrated beam of light that is aimed at the unwanted hair. The light travels down the hair shaft and into the bulb of the follicle where the blood supply to the follicle is located. The absorption converts light into heat energy, which raises the temperature of the bulb causing the blood vessels that supply blood and other necessary nutrients to the follicle to be cauterized. As a result, hair growth is no longer possible. This process should happen selectively and without damage being done to the epidermis or surrounding tissue. A thermoelectrically-cooled sapphire crystal on the hand piece provides continuous skin cooling before, during, and after the treatment for added comfort. Laser hair removal works primarily by targeting the hair’s root. The length of time the hair is kept from regrowing varies greatly from person to person; it could stunt the growth for several months or a few years. Laser hair removal usually requires about six to eight treatments. Sessions are done when the growth cycle is active in the antagen stage, which is when the hair bulb is intact and is closest to the surface, allowing for the most efficacious treatment. After a series of treatments, most new hair growth is significantly reduced; however, if hair does regrow, it will be finer and lighter than before. Touch-up treatments are recommended about twice a year thereafter. Sciton laser hair removal is most successful on people with dark hair and light skin. Dark objects absorb light with more intensity than light objects, so dark hair absorbs the light beam all the way to the hair follicle without targeting the surrounding lighter skin. Laser hair removal does not work very well on blond hair and not at all on white hair. Black people are not the best candidates for this type of laser hair removal because there is no contrast between the skin melamin and the melamin in the hair follicle. Treating the darker skin types can cause hyperpigmentation (darker spots) or hypopigmentation ( lighter spots on the skin). The skin should be cleanly shaved the day before the treatment. The skin should not be tan, including self tanners, because the light will absorb the pigment on the skin before reaching the hair follicle. On the day of the treatment, wear clothing that will allow easy access to the treatment area. The laser is virtually painless, so no numbing creams are required. Some patients will be offered to have a small area tested before undergoing a full treatment. This gives them an idea of how the treatment will feel, and the length of time it will take to obtain the desired result. The laser technician scans the treatment area with laser light. The continuous cooling feature ensures patient comfort and safety during treatment. Most patients describe laser hair reduction as feeling “prickly,” or like the light snap of a rubber band against the skin. Afterwards, it might feel like a bad sunburn. Each patient has his or her own level of skin sensitivity and pain threshold. Different areas on the body are also more sensitive than others. Most patients are able to tolerate the procedure. Treatment time depends on the size of the area to be treated. Facial and bikini areas are usually completed in less than 15 minutes; legs, backs and larger areas can take up to an hour. 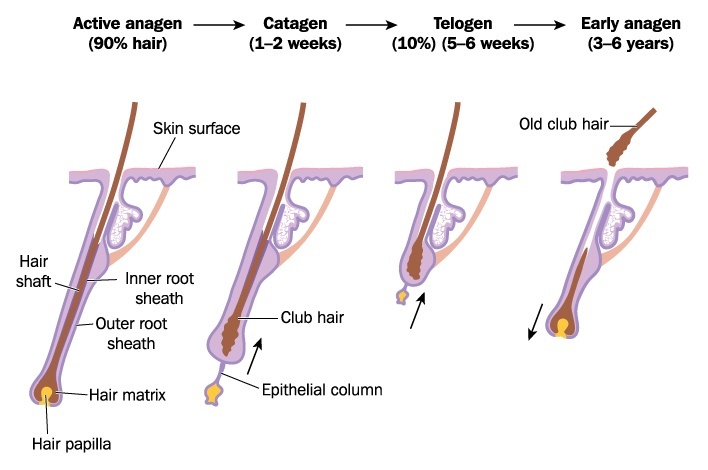 Hair revolves through three phases of growth: anagen, catagen and telogen. It is only during the growing phase, anagen, that hair reacts to BBL light. Not all hair present is in the anagen phase at the same time. Duration of hair growth cycles depends on the body location being treated. Multiple treatments are necessary over a time span of typically 4-8 week intervals to remove hair from most areas. To learn more about laser hair removal, contact the Laser Institute of Wisconsin at (920) 233-1540 to request your free laser consultation. Patients can resume all activities immediately afterwards. Results can be seen 2 to 3 weeks post-treatment. Some redness and slight swelling may be present in the treatment area. However, this should subside within a few hours. Some redness may remain for five to seven days. Strictly avoid any sun exposure to the treated area for a minimum of 7 days after the procedure. The treated area is more prone to sunburn and pigmentation change. Keep the area covered, and use a sun block with a protection factor of 30+. Delayed blistering secondary to sun exposure has been noted up to 72 hours post treatment. A cold compress or an ice pack can be used to provide comfort if the treated area is especially warm. This is typically only needed within the first 12 hours after the treatment. Vitamin E or Aloe Vera applied to the treatment area may provide a soothing effect. Post treatment discomfort is typically minimal but if the area is very uncomfortable, oral pain reliever; i.e. Extra Strength Tylenol, may be used. In the unusual case of crusting of the skin in the treated area, apply an antibiotic ointment twice a day to the affected areas. Do not pick at these areas, as this may result in infection or scarring. Hair appears to grow for several days. Then hair falls out by day 10-14. The next phase of hair regrowth is usually thinner hair at 6-8 weeks. Because the laser affects hairs in active growth phase, which is usually 20% of hairs present, this is the time when the treatment is most effective. Therefore treatments are typically spaced out according to the growth phase, which is 3-4 weeks for the face and 6-8 weeks for the rest of the body. On average, each laser treatment will be associated with some permanent hair reduction. Long lasting hair reduction can only be achieved after several treatments. The number of treatments will depend on each patient’s individual response to laser surgery, and the amount of hair to be removed. The results of laser hair reduction can be maintained with twice yearly treatments of laser hair removal. Sometimes the goal may not be total hair removal. Many patients are happy with a reasonable degree of hair reduction. Hair that remains is often lighter in color and thinner than the original hair prior to laser treatment. Laser hair removal does not guarantee permanent hair removal. Some hair could be resistant to the laser treatment or grow again after treatment. The new hair growth might be finer and lighter in color. Short term effects may include reddening, swelling, bumps, mild burning, temporary bruising or blistering. Hyperpigmentation (darkening of skin) and hypopigmentation (lightening of skin), although rare may occur. These conditions usually resolve within 3-6 months, but permanent color change is a rare (less than 1%) risk. Avoiding sun or tanning bed exposure before and after treatment reduces the risk of color change. Infection following treatment is unusual, but bacterial, fungal and viral infections can occur. Herpes simplex virus infections around the mouth can be stimulated by laser treatment. This applies to individuals with a past history of herpes simplex virus infections and individuals with no known history of herpes simplex virus infections in the mouth area. If skin infection should occur, additional skin treatments or prescription antibiotics may be necessary. Allergic reactions, although very rare, may occur. In rare cases, hives have been reported after laser hair reduction treatments. If you experience an irritated raised rash after treatment contact the office. Benadryl may be taken to help relieve the itchiness. There is a slight risk of scarring and skin textural changes. It is important that patients follow all post treatment instructions carefully. Compliance is crucial for healing and prevention of scarring. Discuss your concerns at your personal consultation. Contact the Laser Institute of Wisconsin at (920) 233-1540 to request your free laser consultation. While every patient and treatment area are different, patients generally need 6-8 treatments for satisfactory hair reduction. Some areas may require fewer sessions, which can easily be adjusted. Unwanted hair is usually a cosmetic issue, so it is not covered by insurance. The Laser Institute of Wisconsin™ charges $25 per laser unit. Sample pricing per session is as follows: arms $100-250, back $300-700, bikini $150-200, chin $100, face $175, legs $300-600, underarms $100. The first 6 sessions for a treatment area are full price. Sessions 7 and 8 are free in the same treatment area. After the 8th session, additional treatments in that area are 50% off the full price. These are considered maintenance treatments. Patients will keep the 50% maintenance discount as long as they return two times a year. If a period of greater than 12 months has passed since the last treatment while in the maintenance phase, patients will have to re-start the sessions at full price. The number of treatments needed will vary based on the treatment area and the amount of hair to be removed. Because every patient is unique, it is best to schedule a complimentary laser consultation. The consultant will personalize a treatment plan that is tailored to your body, your goals, and your budget. The sooner you set up your consultation, the sooner you will see results in the mirror. Don’t live with hair you don’t want. Contact us at (920) 233-1540 or request your complimentary laser treatment consultation online.